Jeti Studio, New Way of Viewing, Analyzing, Programming, and Updating. Telemetry Data Logging & Visualization, Transmitter Data Backup, Transmitter & Receiver Updating, Lua App Manager. Jeti Studio is a cross-platform program for the visualization and analysis of telemetry data received from sensors and receivers. The program is available free of charge as a software support to the Duplex product line. - Real-Time Telemetry Graphic Visualization, Display Charts, Maps, Data Tables…. Warning: After updating your radio to version 4.23/4.24 it is no longer possible to downgrade to a firmware version older than 3.02. Downgrade to 3.02 version is however still possible!!! What is LUA? Lua is a powerful, fast, lightweight, embeddable scripting language. Lua combines simple procedural syntax with powerful data description constructs based on associative arrays and extensible semantics. Lua is dynamically typed, runs by interpreting bytecode for a register-based virtual machine, and has automatic memory management with incremental garbage collection, making it ideal for configuration, scripting, and rapid prototyping. How do you use it? Basic setup is easy. You write an application (script) and put that to SD-card. After that the application is run in your selected model. This means you can have different scripts running on different models. For example you can have constantly updating telemetry-data, make and use graphics and images, use telemetry and voice in a new fashion, you can access SD-card with LUA and so on. One thing I really like that like there is now MX1 - MX16 there will be LUA-controls. If nothing else this opens a whole new world to making transmitter and it's functions really "Your Own". Please read the attached Release Notes prior to performing any update. This document always includes the actual information given to the current version of firmware. 1. 1. 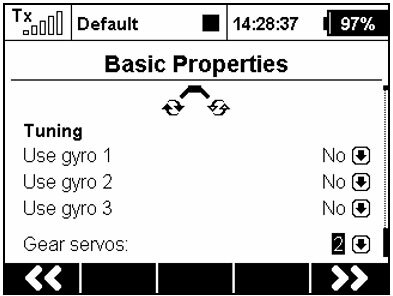 Added the latest device definitions for MFlow2, MRPM Hall, Brain, R3 REX, Cortex Pro, AXON and other devices. 1. While editing the integer values of any transmitter menu, after pressing the MENU button, the number of steps applied is shown in the bar on screen (1x, 10x, 100x). 2. If a flight-mode delay is applied while switching flight modes and a fast movement of a stick is performed, the servos now don’t overshoot. 4. Lua: Integer boxes are now able to handle 32-bit values. 5. DC/DS-14/16: Receiver voltage is now displayed correctly. 6. The volume indicator is now shown in the top bar if volume changes. 7. DC/DS-24: The timing of a PPM signal via PPM Jack connector is now accurate. 8. Fixed: If a user opens a Model selection dialogue while logging is enabled, the situation could lead to creating empty log files. 1. Connect TX via USB to PC. 2. In the TX confirm communication with PC. 3. Download the update file for your language. Unzip its contents into a temporary folder at your hard drive. 4. Copy all files from the temporary folder to the root folder of the SD card. If you have a version 1.05 or older, we recommend deleting the original system sounds located in /Audio folder to take effect of the updated audio files. The updated system audio files are located in /Audio/en folder. In order to keep all your settings please do not delete these files: /Config/Config.jsn, /Config/Calib.jsn. Please keep the /Model folder untouched as well. 5. Switch off and switch on the TX. After that, the update will run. Warning: After updating your radio to version 4.20 it is no longer possible to downgrade to a firmware version older than 3.02. Downgrade to 3.02 version is however still possible!!! 1. (DC-24 only): Model description (a "label" parameter) has been added to the Model - Basic Properties menu. The label is then shown while you browse the model list within the Model Selection menu. The label has an informative meaning and should be used to distinguish between similar models. 2. Lua is now available for DC/DS-14, DC/DS-16 and DC-24. 4. Several function and new options have been added to provide seamless compatibility between DC/DS-16 and 24. 5. Any Lua telemetry screen can be assigned to the top status bar (instead of default clock). See the Timers/Sensors - Main Screen menu. Added option for proportional and smooth Dual Rate/Exponential transition. See the Fine Tuning - Dual Rate/Exponential menu and check the "Prop." option. 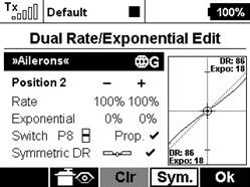 If you assign any proportional control as a DR switch, you will be able to set the DR/Expo values more precisely. 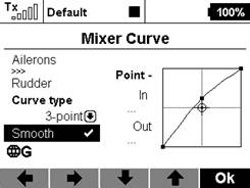 Added option for smoothed function curves (see Fine Tuning -Function Curves, Fine Tuning -Free Mixes, Fine Tuning -Butterfly). 3-Position Momentary Switch Emulation: The up/down positions are active only as long as you hold the corresponding trim button. Default value is otherwise 0%. 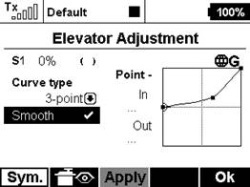 Rotary Functionality: Every time you press the trim button the value is increased or decreased according to trim step. 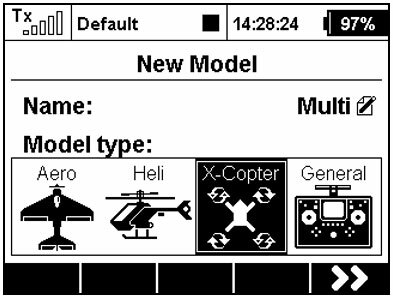 This creates an arbitrary number of predefined positions of the trim control which is useful for example for switching flight modes of stabilization systems. Default value is -100%. 1. Fixed heli and airplane gyro settings (Fine Tuning - Gyro Settings and Governor menus, a problem had appeared in V4.20 and was immediately solved by version 4.20.1). 2. Fixed Throttle Limiter function behavior if an expo value is non-zero. 3. Date in the Model Selection dialogue is now displayed correctly. 4. Sensor selection dialogues now contain sensor name together with parameter name, e. g. "MUI: Current[A]". 5. Frequency response of the vario sound has been modified to better match high performance variometers. 6. 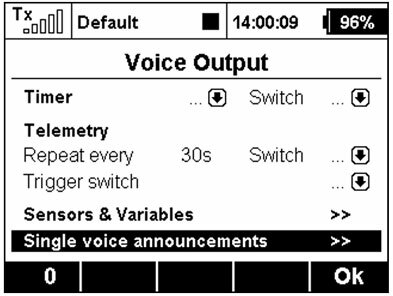 Corrected behavior of telemetry alarms if a "silent" sound profile is selected. 7. Lua: Function system.get Inputs ("P3","P4") now returns correct values for both stick controls. 8. Lua: Function system.vibration() now behaves correctly and according to specification. 9. Lua: The top status bar now displays an informative text if Lua environment is not running ("lua: x"). 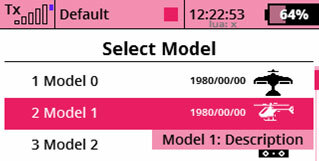 Lua can be stopped for example in the Model Selection menu, Device Explorer menu or while you are creating new model. 10. Lua for DC/DS-16 and DC/DS-14: Optimizations in the Lua core have been applied so that it now consumes less memory. 11. Lua for DC/DS-16 and DC/DS-14: A hard-limit has been set to limit the memory consumption of the applications. If the Lua environment exceeds 50kB, all scripts are killed. Warning: After updating your radio to version 4.00 it is no longer possible to downgrade to an older firmware. Downgrade to 3.02 version is however still possible!!! The DC-16 and DS-16 now support up to 24 fully proportional and programmable channels. This expansion allows you to conveniently install multiple receivers or Central Boxes into a model without additional programming. By default, this feature is turned off. The transmitter enables it automatically as soon as any servo is assigned to any 17-24 channel (see the menu Model -> Servo Assignment). 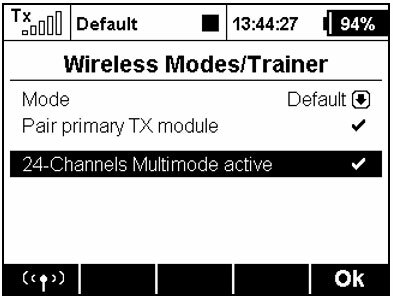 You can see the 24-Channel Multimode status in Advanced Properties -> Wireless Modes/Trainer. 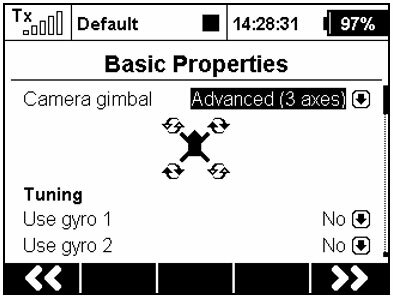 - Camera gimbal can be set as either none (off), basic (2 axis) or advanced (3 axis). - You can use up to 3 functions for in-flight gyro/stabilization tuning. - You can specify how many gear servos will be used. 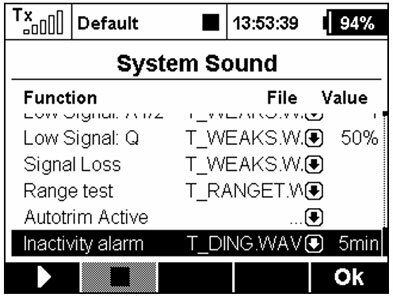 The menu System › System Sound now contains two additional freely configurable system alarms. 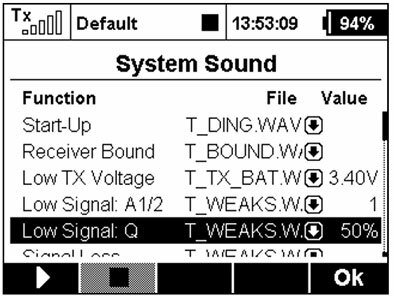 - Low Signal: Q – you can set an audio file and a threshold level for a low signal determined by the quality of the information. If the signal quality drops below the percent value, the assigned audio file will be played. - Inactivity alarm - you can assign an audio file and time interval for inactivity warning. The alarm will be triggered repeatedly when there are no buttons being used and the sticks are holding their last positions for an extended period. 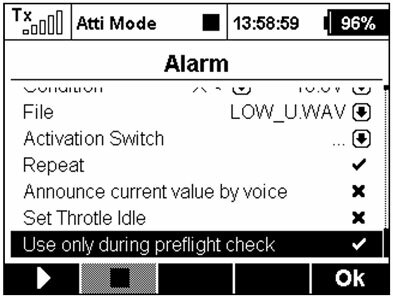 Now you can use any alarm to be a part of a preflight control check. 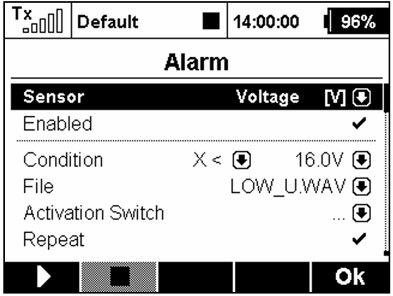 As an example, in the menu Timers/Sensors › Alarms create a new low-voltage alarm (a voltage sensor is required). If you use 4S Li-Pol battery, the alarm condition should be “X<16V” (less than 4V per cell). Enable the “Use only during preflight check” option. This alarm will activate only after the model is changed or the transmitter is turned ON. The Audio Player application now offers a possibility to play audio files sequentially. 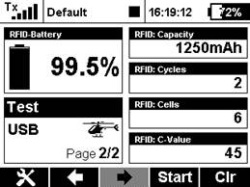 This feature is useful if you practice an aerobatic routine - the transmitter will always tell you the name of the next figure. You can also use this feature just as a background music trigger. The music will not be interrupted by any incoming alarms or sounds on event. 1. Voice announcement of French numbers has been modified (corrected spelling of hundreds and thousands). 2. 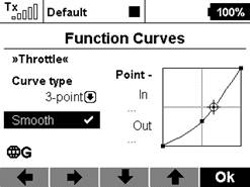 Using Heli Wizard, opening the throttle curve editor doesn’t lead to reboot in case of non-existing throttle function. 3. The sizes of audio and log files are shown in units of KB for files smaller than 1 MB. 4. Solved an issue of 3-times repeated alarms that influenced the function of other alarms. 5. 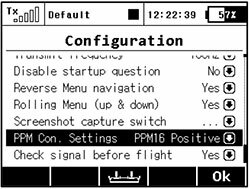 The numeric range of flight-mode trims has been increased to ±125%. Warning: After updating your radio to version 3.02 it is no longer possible to downgrade to an older firmware!!! Possibility to set the output of the internal connector to 16-channel PPM format (see the menu System >> Configuration. Suitable for use with an external RF module. The possibility of asymmetric free mixes, mix output for each servo can be adjusted separately both for positive and negative throws. The Mix output parameter can be easily used to adjust the differentiation for the ailerons to flaps mix and others. Ability to reset the selected timer using the transmitter control has been added (menu Timers/Sensors >> Timers). From now on it is not necessary to activate the CLR button in the main screen. When pushing the Reset switch, the timer is immediately set to the initial value. Now it is possible to set the repetition of alarm messages from the sensor. 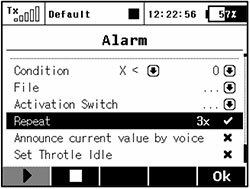 In the Timers/Sensors >> Alarms menu create a new alarm, highlight "Repeat" and press the 3D button twice. The editing form of dual and exponential rates has been improved. Automatic selection of edited parameter depending on the position of the control has been added. Furthermore, the possibility of asymmetric rates for rudder and ailerons has been added. After highlighting and unchecking "Symmetric DR", then pushing the F(4) Sym. button it will be possible to adjust the aileron rates to the right and left independently. 1. The data analysis from the SD card records reads correctly of the all models regardless of the model names. 2. 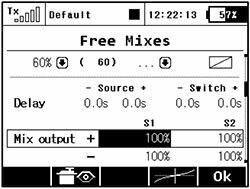 Correct display of the current free mix value when editing its properties. 3. The operation with the internal SD card has been improved. 4. The support for setting the MBar EX sensor via Device Explorer has been added. 5. Additional security question when selecting wrong model has been added. 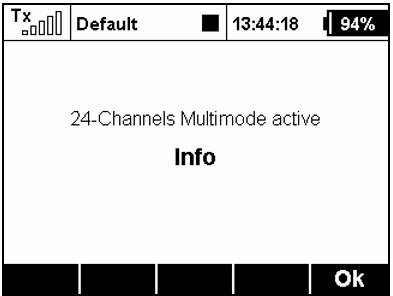 The firmware version 3.24 for Duplex EX receivers brings several new features especially for output pins settings. One of them gives the ability to set the digital interface so that it is possible to set serial communication for control of servo channels on one of the outputs of the receivers, while at the same time generating standard servo outputs for connected servos. This setting is especially advantageous in copter models where a serial interface is used for communication between the receiver and the stabilization system that controls the model. With this update you will be able to simply use a Wireless Teacher/Student function (Buddy Box) together with any third-party transmitters. You only need to supply the R3/RSW with power and PPM signal through the trainer port of the student's transmitter. After that, you should switch the DC/DS transmitter to the "Teacher" mode and bind in a usual way. This update brings additional options for digital inputs and outputs to the Central Box 200. Now you can simply control your LED lights using the Central Box only. The Central Box can function as an EX Bus expander so you can join several Central Boxes together and you will have perfect signal distribution and control redundancy in a model. This update brings additional option of adding third Jeti Duplex 900MHz or 2.4GHz receiver for triple dual band redundancy. The Central Box 400 supports additional receiver via Ext1 port using EX Bus protocol. For proper function the transmitter device folder needs to be updated using new configuration file "CBOX400.bin". The Central Box with the new firmware can also function as an EX Bus Expander. 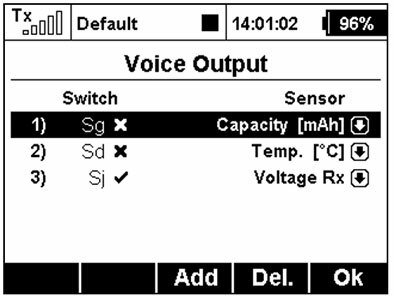 This function can be activated on the Ext1, Ext2 and Ext3 outputs and this will function even if the Central Box is controlled by the PPM signal (Rx1 and Rx2 input). The Central Box transforms the servo positions from the PPM signal to the EX Bus. The Central Box can detect any sensor that can communicate in EX Bus mode and starts the communication with the sensor automatically using EX Bus protocol. The MGPS firmware update brings several additional features requested by users. For example, the SetOrigin function can now be linked to any receiver channel so that resetting the distance before flight is more comfortable. Fuel Consumption Monitoring for Jets!!! 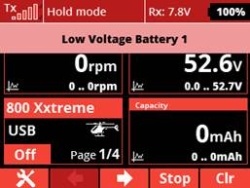 This is a very interesting article from the Jeti site that is of interest to jet modelers as to how to use the MUI 30A Current/Voltage sensors to monitor fuel usage by monitoring the fuel pump consumption as the amount of energy consumed by pump and amount of pumped fuel is linear. 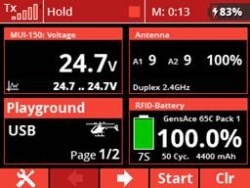 Great usage and imagination in the use of the Jeti Duplex telemetry!!! Alarm for in Flight Turbine Shut Down!!! If the fuel pump draws 0,8-1A at idle rpm and the alarm trigger is set to <0,5A. If the ECU shuts down the fuel pump for any reasons, you get an audio warning "Warning, Flameout!" (Custom Sound for Example). Then you will know in an instant something that you usually need a few seconds, if not more, to realize and potentially safe your very expensive model. The amp-draw information from the MUI 30A Current/Voltage sensors can be used as a flameout warning. Always easy to hear when others are flying around you.